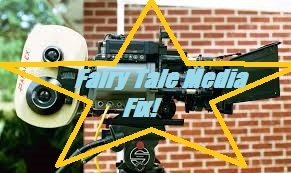 Fairy Tale Fandom: Fairy Tale Media Fix: Oz cartoons. Fairy Tale Media Fix: Oz cartoons. I know I’ve said before that I was sticking with proper fairy tales for Fairy Tale Media Fix but I’m afraid I can’t quite keep that promise. For one thing, reviewing versions of Cinderella, Little Red Riding Hood and Jack and the Beanstalk repeatedly gets kind of boring. So, I’m going to have to loosen things up and include some children’s literature. Now, I know I’ve talked about the Oz books before. They’re an interesting subject. Partially because they’re part of what was a common endeavor among writers for a couple of centuries to create the “American fairy tale”. And partially because it’s a case where a sprawling, popular series of 43 books (including 14 by original author L. Frank Baum) has largely been forgotten by the general public to be almost replaced by a movie adaptation of the first book made in 1939 (it’s a good movie, but come on). It makes you wonder if other landmark works of children's literature will fade into semi-obscurity someday. Someday, will people only remember the Harry Potter books for their Warner Bros. film adaptations? The MGM film isn’t the only legacy of Oz, though. There are Oz cartoons too. Not a lot of them, but probably more than you’d think. Just like the books now do, they tend to slip under the radar. There was a short in 1933. There was Tales of the Wizard of Oz in 1961 from Rankin Bass (the same people who made Pinocchio’s Christmas). There was a DiC Wizard of Oz series from 1990 based on the 1939 movie. There was even a second generation show called Oz Kids. That's just counting TV shows too and not animated movies. Even right now, there are a couple of options. Options that I, luckily, have had the chance to view. Dorothy and the Wizard of Oz is an animated show made by Warner Bros. Animation that airs on Cartoon Network’s streaming service Boomerang. Boomerang, incidentally, is a streaming service I do not subscribe to because I am not made of money. So, I thought I wouldn’t be able to see this show. Luckily, there was a DVD release. Now, Dorothy and the Wizard of Oz is based on the 1939 movie. So, a lot of that actually makes it into this show. The Scarecrow, Tin Man and Cowardly Lion all have voices that sound a lot like the voices of the actors in the movie. The ruby slippers are still around and Dorothy uses them as a teleportation device. The Wicked Witch of the West is still around in all her green, cackling glory. Though, the witch is just a spirit living in a crystal ball at this point. However, even beyond all the movie influences, they still draw a lot from Baum’s books. From the episodes I was able to watch, other Oz characters from the books that appear in the show include: Ozma, the Woozy, the Hungry Tiger, Ojo the Unlucky, the Nome King, H.M. Wogglebug T.E., the Patchwork Girl, Tik Tok and the Crooked Magician. None of them are exactly like their literary counterparts. Ozma comes across as a little more ditzy. The Patchwork Girl is less crazy poetry girl and more of a highly skilled royal dressmaker. Strangely, from the episodes I’ve seen, one of the few Oz characters not in the show seems to be the Wizard himself, despite his name being in the title. The one major new addition that’s not from either the books or the movie is a new character named Wilhemina. Wilhemina is a young witch and the Wicked Witch of the West’s niece and she’s set up as a rival of sorts for Dorothy. While her aunt’s spirit is constantly trying to get Wilhemina to retrieve the ruby slippers, Wilhemina usually wants to mess with Dorothy out of pure jealousy and spite. In this endeavor, she’s helped by her two flying monkey henchmen, Lyman and Frank (I see what you did there). And you know, the show’s not half bad. It’s a very episodic show aimed at pretty young children, so you take what you can get. The art’s expressive. The animation’s fluid. The actors put in a bang up job. I particularly like the show’s new take on Dorothy. Despite being so influenced by the 1939 movie, this Dorothy isn’t the “damsel-in-distress” she often seemed to be in that film. The TV show’s Dorothy is a plucky country tomboy who eagerly rushes off to help others with a click of her heels when she finds out someone needs help. So, if you get the chance, give it a look. It may not be appointment viewing unless maybe you’re watching it with one of the small children in your life, but it’s at least worth a casual watch. Lost in Oz on the other hand is on Amazon Instant Video, a streaming service that I am subscribed to. Now, first of all, I should make the point that this is in no relation to another show called Lost in Oz from 2000 that was produced by Tim Burton never got past the pilot phase. This Lost in Oz is a daytime Emmy winning computer animated kids’ show that premiered last year. The story follows an inventive twelve-year-old girl named Dorothy Gale and her dog Toto as a magical journal whisks them off to Oz. This Oz is very different, just as this Dorothy is different. This modern day Dorothy lands in a bustling, modern Emerald City. The magic of Oz is now channeled into the technology that runs the city. In fact, their knowledge of magic seems to have advanced as well. Magic is now defined as “the art and science of transformation” and it’s controlled by magical elements that all appear on their own complex periodic table. Essentially, magic is the physics of Oz. Anyway, Dorothy finds out that she needs one of each magical element to get home. Along the way, she meets some new friends like an oversized Munchkin boy named Ojo (which I’m guessing is a common Munchkin name now), a sarcastic young witch named West and a paranoid conspiracy theorist lion named Reigh. She also gets embroiled in a mystery and runs afoul of some villains. We also find out that this Dorothy isn’t the first Gale to visit Oz or even the first Dorothy for that matter. Lost in Oz is a STEM-infused, techno-fantasy mystery adventure show inspired by a turn of the century children’s fantasy book series and it is very good. I think the characters are great. This Dorothy is a bright, brave young heroine with a knack for inventing devices and experimentation. Reigh’s paranoid conspiracy theorist personality is a unique twist on the Cowardly Lion. Sarcastic and streetwise West is probably my favorite new take on the Wicked Witch of the West ever (that’s right, Wicked fans. Come at me). Ojo, while maybe not as big a character as the others, is useful as a slightly more down-to-Earth presence. And I just love the more scientific and technological approach to magic. It’s rare I say that. When books, movies or TV shows try to go into the “science of magic” it usually results in the magic being diminished in some way. That doesn’t happen here. Probably because this approach is used to develop a system of magic for Oz, not to explain it away. It’s something that makes sense for Oz too. Oz grew out of the environment of a rapidly industrializing and scientifically growing United States. L. Frank Baum even made use of some of this new technology, the motion picture camera, to make some of the first Oz movies (though, there were also a couple made without his input). Heck, some of the fantasy devices in the Oz books seemed to predict the future. In the book Tik Tok of Oz, Baum has it so the Scarecrow carries a special two-way transceiver that he can use to communicate with the Emerald City. That’s right. The Scarecrow may have had the first cell phone in literary history. I will heartily recommend Lost in Oz. People keep looking for ways to put new twists on public domain properties, but this is one of the few that really feels different. It’s not another dark, dystopian take like Emerald City or Tin Man or that Tim Burton Lost in Oz project, while still skewing a bit older than stuff like Dorothy and the Wizard of Oz. This modern, science fantasy Oz just feels like no take on Oz I’ve seen before. Really, check it out if you get the chance. That ends this particular Oz-themed installation of Fairy Tale Media Fix. I’m not sure where the next post will take me, but until then I think I’ll just head down this Yellow Brick Road a little farther. Four-Color Fairy Tales: Fairy Godbrothers.